I hope you’ve seen Little Free Libraries. In fact, I hope you have a Little Free Library in your neighborhood or even in your yard. If you’re not familiar with them, Little Free Libraries were started by awesome Wisconsite Todd Bol, who wanted to honor his mom, a bibliophilic former schoolteacher. He put one in his yard and built a couple for friends. And like that old shampoo commercial, they told two friends, and they told two friends, and soon the world was filling up with awesomeness. Read more about the history of Little Free Library. 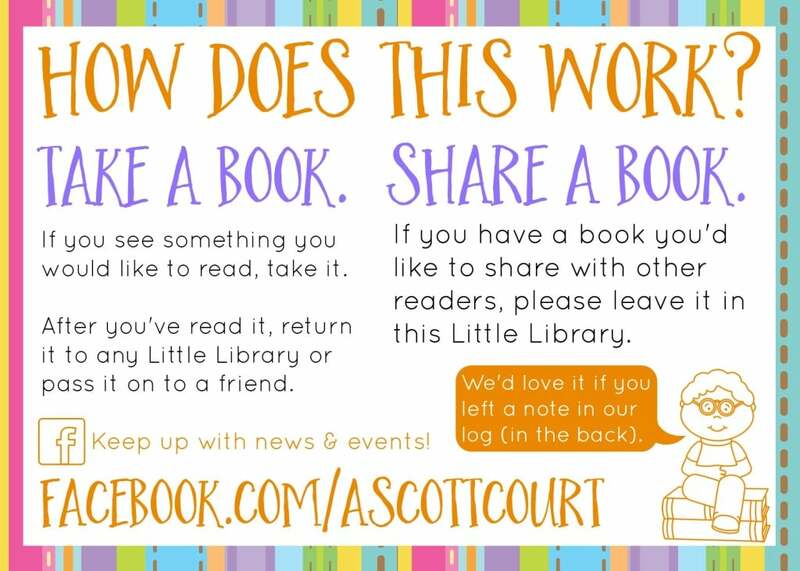 This is the story of Little Free Library Charter 24768 and how it came to be the Ascott Court Little Free Library. 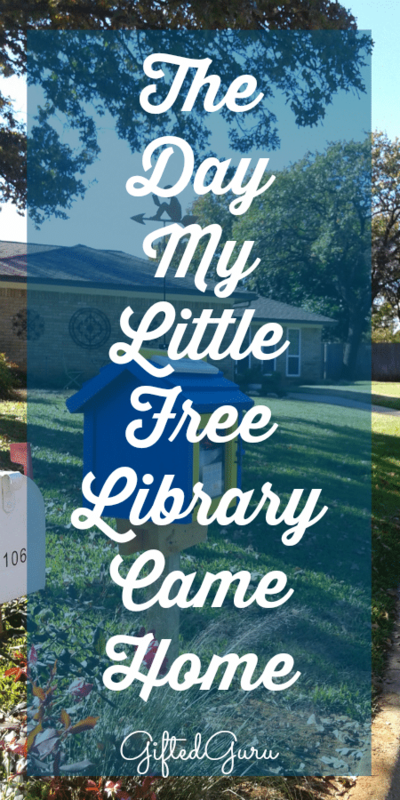 I first heard about Little Free Library in 2012, and I wanted one right away. I mean, like, really, really wanted one. I like books. I mean, I really, really like books. You can read about some of my adventures in that area here. I bought the registration (Charter Number 4934), and that was where the story ended. For awhile. For nearly three years, the little sign sat neglected in the back of a filing cabinet until I could figure out how to build the library on which to put it. You have to use negative numbers to evaluate my carpentry skills, so the library sign stayed tucked away. I serve on the Reading Promotion Partners board for the Library of Congress through my role as Mensa‘s Youth & Education Ambassador. This March at the meeting, the founder of Little Free Library was there (with an awesome library, actually), and I remembered my forlorn sign tucked away in the filing cabinet. I felt guilty and inspired at the same time. If you’re going to feel guilty, I highly recommend accompanying it with a side dish of inspired. My carpentry skills had not improved, so I decided to start saving my allowance (My husband and I each give ourselves $50 a month mad money). I saved up enough to buy a ready-made library and have it installed (including some birthday money). 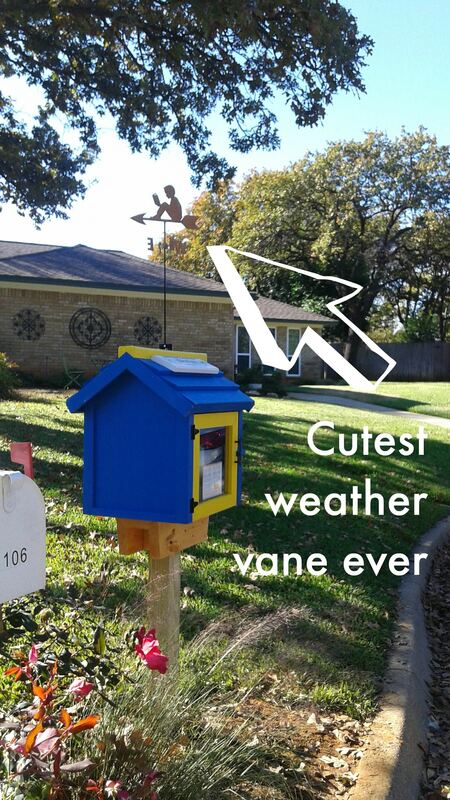 I even had enough for a custom stamp and the cutest weather vane you have ever seen. I went to the Little Free Library website and I found the perfect library for sale! It came with books, even! It was the colors of the high school at which I taught English for years. How perfect is that? I ordered it, and soon there was a big box in my living room. I hired the man who installed our mailbox to help me install it (he worked while I did a happy dance, so there was a fair division of labor going on). My neighbor even gave me that cute little handle shaped like a twig. See it? So cute. I made a little sign to tell people what to do with the Little Free Library and taped it in the window. I put a log book in it, as well as little lights so you can browse at night. The log is really in the back tucked behind the books, but I put it in the front for this picture. 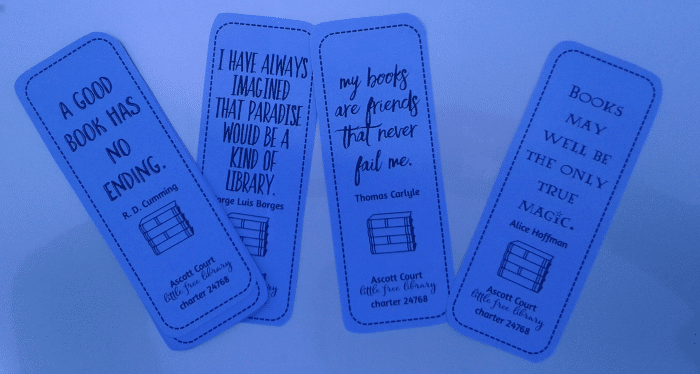 I even made cute little bookmarks to put in it. The quality of that photo is somewhat diminished by my having taken it on the trunk of my car. Just bein’ real, folks. I made a Facebook page for the Ascott Court Little Free Library so I can keep the neighborhood (and other interested parties) up to date with happenings and cool Little Free Library stuff. The Library came with a charter, so I still had my lonely charter 4934 in the filing cabinet. Think about it – in January 2013 when that sign arrived, it was 4934. Now, my charter is 24768. Wow!!! You go, Little Free Library! So, what to do with the charter? They cost about $70 for the wood sign (which is what I have), so I didn’t want to just discard it. I decided to…give it away! This giveaway starts now and goes until the end of next week. All you need to do to enter is leave a comment telling me where you’d put your Little Free Library. I would suggest that “back of the filing cabinet” will not result in a win. 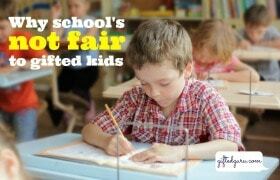 (Actually, I’m using some giveaway software to help me ensure fairness). I’ll mail the winner the charter sign and paperwork next Saturday. 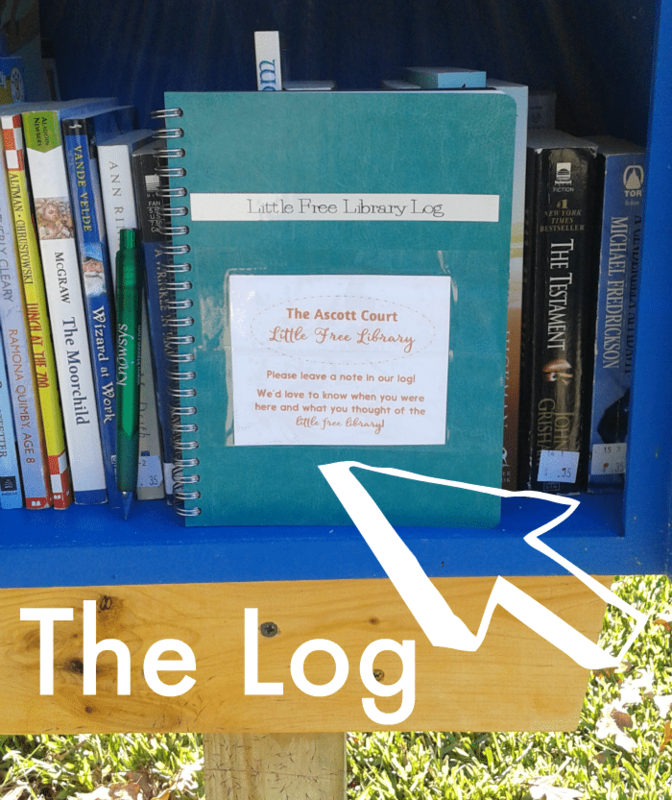 Update: Congrats to Sallie F., who won the Little Free Library charter! 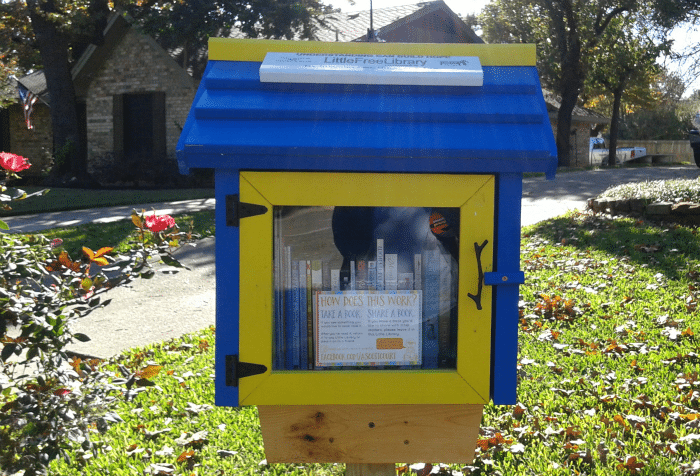 I hope that this little library encourages people to read. I hope it brings a smile to people who see it when they come by. I hope that it will give back to the reading universe, in some small way, all that reading has done for me. I also hope you’ll go find a Little Free Library near you (if you can’t visit mine!). This map will lead you. It totally would! Your neighborhood is perfect! Kara and I want to do one, but haven’t yet figured out where to put it. Yours is great! I would either put it up at the end of out street so walkers would notice it or put it in the native garden at our school, if allowed. But either way, I look forward to sharing my love for reading!!! I am an elementary school teacher (in fact, I follow your website since a time I attended a class you taught at my district). That said, a bunch of students of my school live in an apartment complex, and many of them do not have Internet access or a nearby library. I think that place would be a perfect location for a Little Library! I’ve always wanted to do this! I would put one near my hometown of Branson because the library system isn’t great. They do the best with what they have, though. Not a lot of library bonds pass. There is also quite a bit of homelessness, so I would maybe try to place it near temporary housing frequented by that population. Our neighborhood just installed ours a few weeks ago. It was a true community effort from building, to painting, to roofing, mural painting and installing.. Plus all the work to get HOA approval. So excited. I can imagine how much work that was! Congrats on the installation. Do you have a picture of it? I live a few blocks from what was my daughter’s elementary school. Our street get a lot of traffic from kids and adults as they go back and forth to school and walk their dogs. I would love to have the charter so I could put up a library for everyone to enjoy! 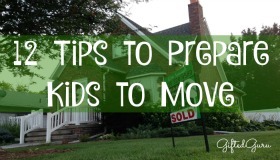 I would put mine up at our TAG school in the garden so the children and the neighborhood could enjoy it! I’ll bet the kids would love making the library box themselves! Oh, if you had the tools and someone with know-how, I bet you’re right!